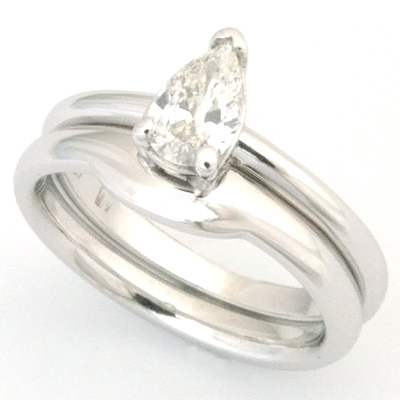 18ct White Gold Fitted Wedding Ring for Pear Cut Diamond Engagement Ring — Form Bespoke Jewellers Ltd. The customer came to us looking for a fitted wedding ring that would sit alongside their pear cut diamond engagement ring. A solitaire pear cut diamond engagement ring can be difficult to match with a traditional wedding band. 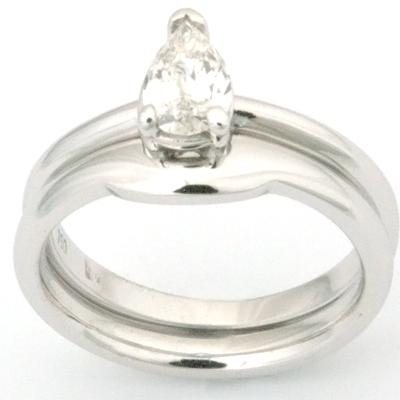 The unusual contours of the ring can mean a plain band may not lie flat against the profile. As a bespoke jewellers, we are able to hand make a fitted wedding ring that would sculpt around almost any engagement ring style. Firstly, a handmade pewter model was created of the proposed wedding ring. This was hand carved to fit like a jigsaw puzzle against the pear cut diamond engagement ring. The customer is able to view the prototype before it is sent to our casters. On their approval we had it cast in 18ct white gold. Following a final fitting, this bespoke ring was hand finished by the team at Form Bespoke Jewellers. The wedding ring compliments the engagement ring in style and proportion as well as fitting perfectly against it.